A collection of Muir's previously unpublished essays, released shortly after his death. 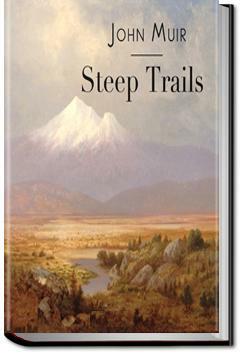 "This volume will meet, in every way, the high expectations of Muir's readers. The recital of his experiences during a stormy night on the summit of Mount Shasta will take rank among the most thrilling of his records of adventure. His observations on the dead towns of Nevada, and on the Indians gathering their harvest of pine nuts, recall a phase of Western life that has left few traces in American literature. ... The landscapes that Muir saw ... will live in good part only in his writings, for fire, axe, plough, and gunpowder have made away with the supposedly boundless forest wildernesses and their teeming life." This book got me into Muir. I've read every book he has written since. This is a book of short stories or recounts of some of Muir's travels. You can see the places he visited through his eyes as they were back then. An enjoyable read. Muir paints a vivid landscape with his descriptions. I am drawn to his wonderful musings such as, "Going to the mountains is going home."